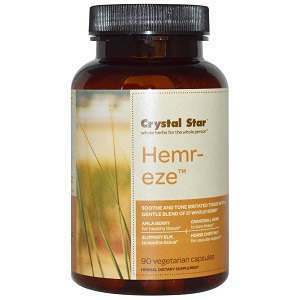 Hemr Eze Capsules is used to soothe and tone irritated tissue with astringent herbs. It can help with most of the symptoms of hemorrhoids. Hemr Eze Capsules is known to relieve itching, burning, swelling and pain that is known to happen with hemorrhoids. Goldenseal Root-Goldenseal Root can help in the treatment of hemorrhoids and stomach upset. Slippery Elm Bark-This plant is used to treat Diarrhea, Constipation, Hemorrhoids and Irritable bowel syndrome. Borage Seed– This seed can be used for the treatment of pain and Inflamed veins. Cranesbill Herb- This herb is responsible for soothing the digestive tract, and it is useful in preventing and treating frequent diarrhea. Prickly Ash Bark- Prickly Ash Bark is used for the treatment of swelling. Myrrh Gum- This can be used to treat hemorrhoids and indigestion. Witch Hazel Herb-Is known for the treatment of diarrhea. Butcher’s Broom Herb- Can be used to treat constipation and hemorrhoids. Bilberry- Can help in the treatment of skin problems and hemorrhoids. Capsicum- Is known to be helpful in the treatment of Irritable bowel syndrome and cramps. The recommended dosage for Hemr Eze Capsules is: Take 2 capsules 3 times a day. The price of one bottle of Hemr Eze Capsules is $32.95. Hemr Eze Capsules comes with a 30 day return policy. They accept the return of products that are defective due to defects in manufacturing and/or workmanship. While Hemr Eze capsules seem to be an affordable way of finding hemorrhoid relief, when compared to the top products. John Parker	reviewed Hemr Eze	on October 22nd	 and gave it a rating of 2.5.